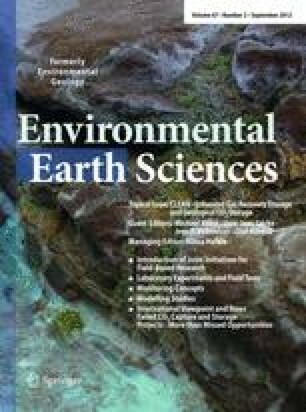 Capture and geological sequestration of CO2 from large industrial sources is considered a measure for reducing anthropogenic emissions of CO2 and thus mitigating climate change. One of the main storage options proposed are deep saline formations, as they provide the largest potential storage capacities among the geologic options. A thorough assessment of this type of storage site therefore is required. The CO2-MoPa project aims at contributing to the dimensioning of CO2 storage projects and to evaluating monitoring methods for CO2 injection by an integrated approach. For this, virtual, but realistic test sites are designed geometrically and fully parameterized. Numerical process models are developed and then used to simulate the effects of a CO2 injection into the virtual test sites. Because the parameterization of the virtual sites is known completely, investigation as well as monitoring methods can be closely examined and evaluated by comparing the virtual monitoring result with the simulation. To this end, the monitoring or investigation method is also simulated, and the (virtual) measurements are recorded and evaluated like real data. Application to a synthetic site typical for the north German basin showed that pressure response has to be evaluated taking into account the layered structure of the storage system. Microgravimetric measurements are found to be promising for detecting the CO2 phase distribution. A combination of seismic and geoelectric measurements can be used to constrain the CO2 phase distribution for the anticline system used in the synthetic site. This study is funded by the German Federal Ministry of Education and Research (BMBF), EnBW Energie Baden-Württemberg AG, E.ON Energie AG, E.ON Gas Storage AG, RWE Dea AG, Vattenfall Europe Technology Research GmbH, Wintershall Holding AG and Stadtwerke Kiel AG as part of the CO2-MoPa joint project in the framework of the Special Program GEOTECHNOLOGIEN. The authors thank all project partners in Kiel, Leipzig and Stuttgart and colleagues of the GEOTECHNOLOGIEN program (publication number GEOTECH-1992) for their help, assistance and efficient cooperation.